What? Me again? Yes. I finished my Linden today (straight 18 out of the envelope). But not without some hiccups. Matching the stripes went well. And putting together the body was pretty easy. What tripped me up was the neck binding. I found it too short. Like way too short. For some reason the binding didn’t feel as stretchy as it should have been. I checked the length against the pattern piece and it matched. I’m at a loss as to why the binding didn’t work. I didn’t have much fabric left so I had to cut a new one a scrap in the bin. It ended up being too long (of course!) but I finally got it good enough. Another goof came when I realized I cut two left sleeves. Oh, bother. Again, luckily I had enough fabric left to cut another sleeve, but it would be shorter than the other. Hence 3/4 sleeves. The Linden sweatshirt came together quickly, but not as quickly as I imagine for others. For the first time I used my serger to sew a garment. I only use it to finish seams. I found it very tricky to make sure both edges got serged. Quite often I had holes where the serger missed the edge of the fabric. Does that happen to other people? Maybe I was using a smaller seam allowance than 1/4 inch? Also, I found it frustrating to sew in the round. Should I be constructing in a different order, say, attach the bindings/hems/cuffs flat and then go from there? Goodness, I feel like I am learning to sew anew! I would so appreciate some knit sewing tips and/or references because I’m a bit stumped at where to go from here. I’d hate to take a long time to sew such a simple top (especially when I want to make a bunch). Or maybe I’ll get better with practice? My, I am just full of lots of questions this evening. This entry was posted in Grainline Studios, sewing woes, shirt/blouse, Top and tagged grainline studios, sewing. Bookmark the permalink. I teach this pattern in a Sewing with Knits class and I always have my students add length to the neck binding because I find it too short and they go crazy trying to sew it on. I think the length is fine for using actual ribbing fabric with mega stretch, but when you’re using normal knits or sweatshirt fleece that aren’t as stretchy, it’s kinda a nightmare to get it to fit without completely distorting everything. I always try to cut off a sliver of fabric with my serger blade when I’m using it to construct a garment so I can be sure the stitches are catching all the layers. Or I bump the bottom layer ever so slightly out from underneath the top layer so I can more easily see that both layers are sewn. Anyway, I think your top is awesome! I love the stripeys. Thank you for the tips! I’m glad it wasn’t me cutting the binding incorrectly. How much longer is the new binding cut? I tried one two inches shorter than the circumference and it proved too long. Thanks again! I have a few friends who do the same! If I can’t figure out the serging a garment bit, I’ll go back to just serging seams. At least there’s more control that way! Lots of perfect stripes! And how can you help but spot the boy! They are cute when they are young… And always “photobombing”! I think this looks great!! Serging a garment together takes some getting used to for sure. I have found that for cuffs, I pin them on the sleeve with four pins, then when I serge (I go really slow), I serge from the inside of the sleeve, so the foot is on top of the sleeve side not the cuff side, does that make sense? I always cut a little bit of fabric off with my serger even when it calls for a 1/4″ seam. I had a few troubles with the neckband too – I think it depends on how stretchy your fabric is. For ribbing, it needs to be a tiny bit shorter, and for self fabric depending on stretch it needs to be longer. Hope that helps! PS: Your son is adorable!! Heather, have you tried putting the cuff inside the (inside out) sleeve instead of stretched on the outside? I find it much faster and easier! No I haven’t! I’m gonna try that next time! 1. I never ever use the pattern piece for bindings, because it’s totally dependent on the fabric. I prefer just to cut a rectangle longer than I’ll need and wing it. Takes some practice to get the right tension/stretch, but your fingers will learn quickly! 4, Hmmm, sewing in the round… I prefer it, but I know some people like to sew binding flat! For sleeves, I always have the shirt inside out and the cuff inside the sleeve opening. That way the machine naturally eases the larger sleeve onto the tight cuff, and you don’t have to pull or stretch anything. I sew with the serger foot on the inside of the tube, if that makes sense, so that I don’t accidentally catch the other edge of the cuff without noticing. Thanks so much for kicking me with all your knick knowledge. I was going to email you but so glad you chimed in and answered my questions. I will check out that post you wrote a while ago.I vaguely remember it. There – I did a post on how I do sleeve cuffs, because I don’t think I can explain it well in a comment! Hope it helps! Oh, and pins – use as few as possible! I use 3 pins to hold the neckband on while I sew, and maybe 4 if there is a hemband… 1 for a sleeve. Like you, I’m afraid of messing up my serger. I find most knits stick to themselves and are well behaved. Mela, this is seriously tops! The stripe matching at the back is totally on point 😀 And you are one brave lady constructing with a serger- I’m still not there yet. Too scary! I made a stripy Linden a few weeks ago and could only get the stripes to match on the back 😦 Yours looks much better! I took a class on sewing with knits on Craftsy a few years ago. The instructor recommended making the bindings 7/8 the length of the opening. That usually works for me, but it does require you to measure the opening first. I’ve made 6 Lindens so far, and for all of them I’ve used the neck binding given in the pattern. It does feel tight at first, but then I iron it into submission. 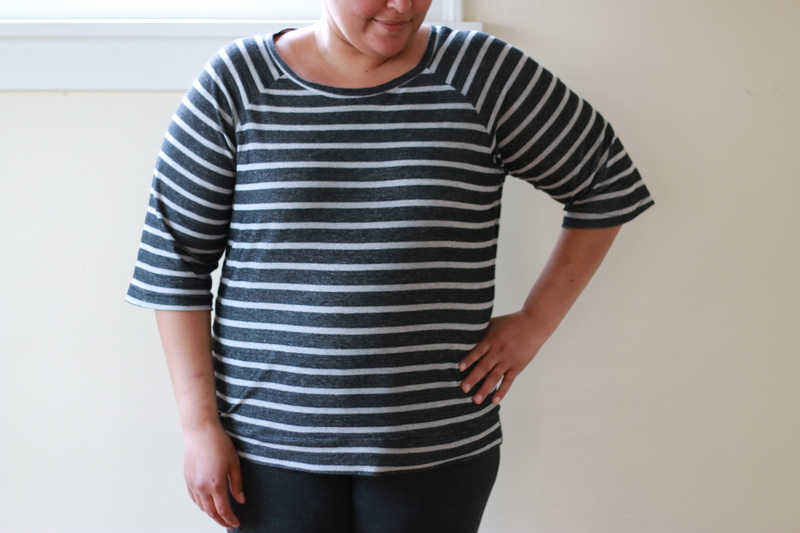 I like the way it brings the neckline in to more of a crew neck than a wide neck. And I do the same thing that others have mentioned – even with a 1/4″ SA, I make sure I’m cutting off a tiny sliver of fabric so I know that the seam doesn’t have any missed parts. I may have not been as persistent with that binding as I should have been. After a few attempts I went for the longer binding and it came out with a wide neckline. I don’t mind it but I would love the crewneck look.I am going to see how the next one goes. If nothing else I’ll just get some ribbing and go with that. I totally want to make a bunch so I will sort it all out.Thanks for the tips! Hey, pretty good for a first garment construction on the serger! Looks like it fits you really well, and the stripes are great. I can see you using your new found serging skills to make a whole batch of these, though I don’t really have any new tips for you. Making sure there is some fabric for the blade to trim off is key, though. That’s what it’s there for, after all! Those stripes on the back are really perfect! If I’m serging something in the round I will usually baste it first to make sure everything is in place. It can be tricky serging around tight curves! Great shirt! I use my serger for sewing with knits a lot but never for sewing things in the round. I prefer to use the sewing machine + walking foot for that, I feel like i have more control that way. It looks great! I construct knits entirely on the server now and I love it. So much faster! It does take a bit of getting used to but once you get your sea legs (so to speak) you’ll never look back! I haven’t had an issue with the length of the Linden neckband but then I’ve always used rib knit for my bands. Might be a different story if I used self fabric bands. I agree with the people here who sort of feel out their neck binding- all of Jen’s Lindens are made using actually ribbing, which is way stretchier than most self-fabric, so that’s why the pattern piece feels short. I tend to aim for 80% of the length of the opening, depending on how stretchy the fabric is. Oddly, sometimes I serge the entire garment, but other times I zigzag first and then serge. I think it depends on how confident I’m feeling! With stripes, I almost always zigzag first as I feel like it’s harder to keep the stripes aligned with just the serger. But that’s just me! Thank you! I bought a bunch of ribbing yesterday so I can take the guesswork out of the self-fabric binding cutting. And I totally think Ollie and I are going to have matching Ts in our future. Love it! I just got my serger so I’m glad you asked for some advice. It’s helpful for me too! And I agree with Gingermakes Ollie needs one too! I agree with everyone about using a serger to sew garments – I do it, and I haven’t had a stitch pop yet! For me, it took some getting used to though, especially with serging in the round as you mentioned. I raise the needles and lift up the presser foot, and then I slide in my sleeve cuff (or other round seam) and start serging at the edge, but quickly veering inward to start trimming a bit off the seam (maybe 1/4 inch). When I get back around to the beginning, I trim off my initial stitching since it was too far away from the seamline (i.e., right at the edge of the fabric). Then I just veer off the edge to finish. Does this make any sense? I find that this works well, although it’s a little fiddly at first! I think I see it in my head. I will have to give it a try. Thank you! Love it! So frickin’ cute. And I had the trouble with the neck binding too! Serger construction? That sounds awesome, in the original sense of the word (terrifying). Whenever people say, “Whipped the whole thing up on my serger,” I have no idea what they mean. Yet! It looks amazing. 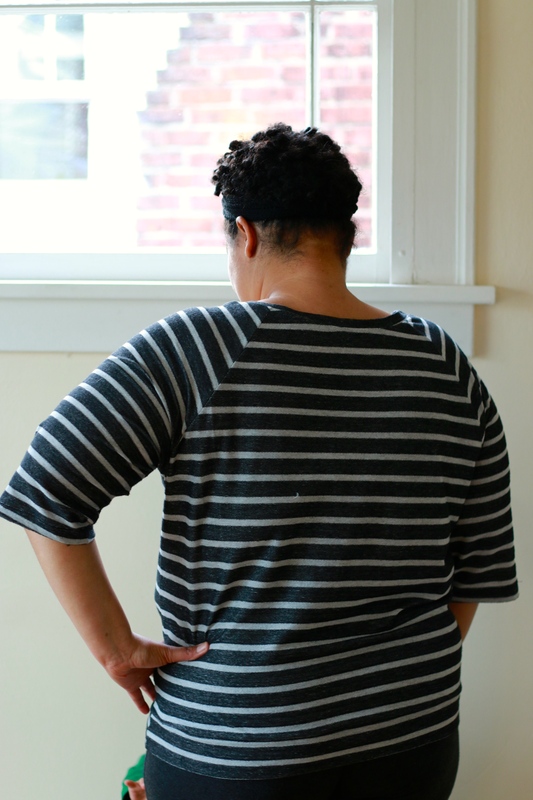 I’m sorry to hear about your bumps along the way, but have you seen that back stripe-matching? Perfection. Nice! I bet this will get lots of wear. And I’m sure you’ll get faster. For what it’s worth, I am not a fan of just serging a knit garment. I have issues like you and I just don’t feel that the seams are as secure. I always sew and then serge for more control. I totally understand the control issue. If I can’t figure out a stable way of sewing knits on the serger I’m going back to the sewing machine. It looks totally great, congratulations. And greetings to Seattle! It looks awesome to me! I love your blog, and all the clothes you have made!